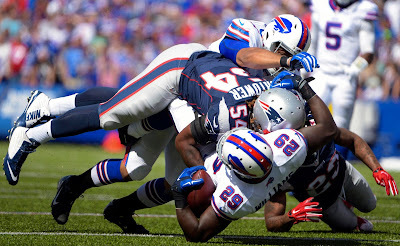 Should the Patriots sign RB Karlos Williams? Soon after Karlos Williams got released, several media outlets suggested that the power back may be a good fit for the Patriots to at least challenge LeGerrette Blount for that role on the team. Coach Bill Belichick always prefers to have at least one big back on his roster to grind yards between the tackles. Blount received a lot of criticism last season for a subpar year when he appeared slow and not as powerful as in his past campaigns. Many questioned whether his career was finished. Williams had a productive rookie season with 517 yards, 7 TD's, and a 5.6 YPC. Just looking at the numbers makes signing Williams seem a no brainer for almost any team. However, one needs to open the hood(ie?) in order to see who the real Karlos Williams is. First of all, Williams has a history of off-the-field problems, which began at Florida State when he was investigated for domestic assault. Although the case was dropped, that was not his only trouble. Since he violated the NFL's substance abuse policy, he was banned for the first four games. Remember that the four-game suspension only takes place after multiple violations. Given that Williams only has one year of service under his (ever expanding) belt, that is not a good sign of things to come after such a short time. Oh, his belt. Reportedly, Williams showed up to training camp 20-25 pounds overweight. Apparently, his substance abuse led to too many late night trips to Sonic. Belichick has said on repeated occasions when talking about players he likes that they show a commitment to football. Showing up to camp out of shape is the antithesis of athletic dedication, especially for a running back. Finally, in recent years, the Patriots have not had good luck in signing players with character issues. Early in the BB era, there were several examples of how the coach could transform a bad apple into apple crisp. Bryan Cox, Corey Dillon, and Randy Moss were examples of players that resurrected their careers in New England with productivity on the field and good behavior off the field. The result was that the Patriots bought low and generated strong results from each man. Roster management. However, recently the team spent assets on several players with checkered pasts and hoped to yield high returns on its risky investments. Instead, the plan often backfired and they were forced to part ways with players such as Aaron Hernandez, Brandon Spikes, and Alfonso Dennard. With the retirement of Jerrod Mayo and the Tom Brady deflategate suspension coming new leaders in the locker room need to emerge in order to lead this team to the promised land in the first quarter of the season. This not only involves making sure that younger players learn The Patriot Way, but also that they obey the NFL conduct policy and stay out of trouble with the police. A wild card like Williams does not seem like the necessary ingredient for the magic potion. So let the circus acts of the Cowboys, the Raiders, or the Jets sign Williams. He'd look great with any of those teams in his XXXL jersey.